You may be thinking about a chore chart or trying some other way to get your kids involved. Getting your children to help out without having to ask them numerous times can be a challenge if you don’t have the right pieces in place. Kids need to learn WHAT to do and HOW to do it. They also need to understand that by NOT doing it, they will not have privileges that come along with being responsible. They need to understand they are adding value to the family by contributing to their chores. 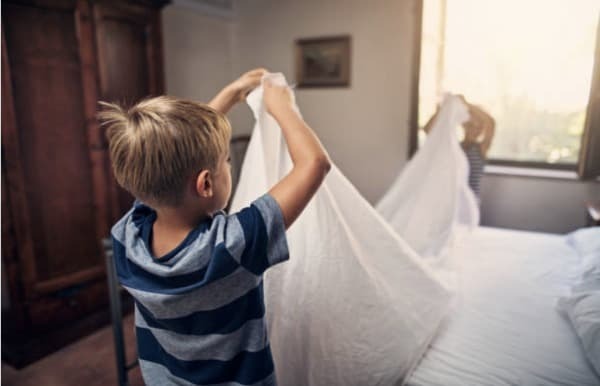 If you are just starting out, making chores a family project that provides plenty of fun, as well as some responsibility, can help you get your kids to chip in and help while they are learning just what to do. Try these tips to get your children involved in the action of completing their household chores. Children naturally get bored, and having them complete the same tasks can be a bit redundant for them (as well as you). They may fight you or just not do what you ask. To keep their interest, give them different chores. 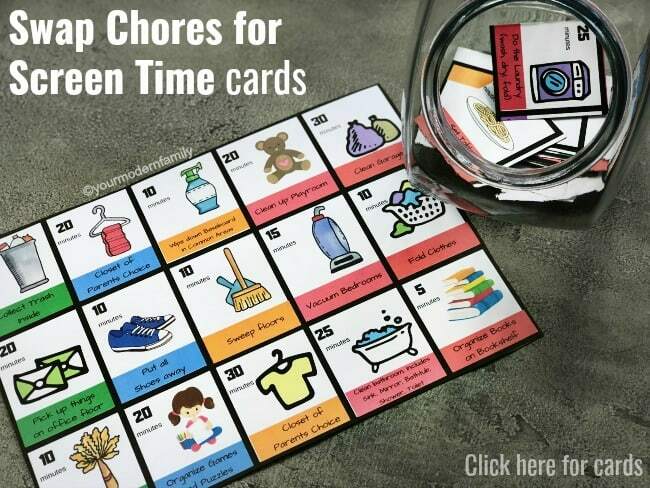 You can even use these chore cards and let them pick the chores. You’ll be surprised at how receptive they are to doing something new for a change. When you allow your children to pick what jobs they do around the house, they feel like they have a choice in the matter. It is less of you telling them what to do and more of them being independent in their decisions. When your kids are involved in the actual process of picking their chores, they are more apt to complete them. Having a little fun with your kids as you do the work around the house can make these tasks easier for everyone involved. Have a race to see whow fast you can unload the dishwasher. Or, try playing a game of “I Spy” with household objects. This can keep your child’s mind off the task at hand and more attention on the game you have chosen to play. This will help your children look forward to helping out around the house because it is so much fun. Nothing can feel more frustrating for children than having to do chores on their own. Join in on the job and make this a time that you bond with your child. Tell them stories about when you were a child or when they were younger. Peak their interest with a good tale so they will see cleaning as a time to learn more about you and your family. This can be a great opportunity to learn more about your child and their dreams, desires, and thoughts. Make your household chore time a dance party. Play some of your children’s favorite songs and dance your way through the task list. This will be a good workout for all and help the time pass as your child shows off their dance moves to popular tunes. This is a good way for children to understand that household chores don’t have to be boring as with a little inspiration everyone can have a little fun. When you hand out the list of chores for your children to do themselves, let them trade with a sibling if they don’t like some of them. This will encourage sharing between siblings and help to build a strong relationship between brother and sisters. Make sure everyone agrees on what jobs to trade, so it stays fair. Ensure your children know the rules of the house before they play. Allowing your children to use their team building skills early on will help them as they progress through school and have to work with others. Getting your children to lend a hand when it comes to the household chores doesn’t have to be difficult. With a little creativity and these helpful tips, you can get your kids to help out around the house without any fuss. Make it fun and make it purposeful and you’ll have a winning recipe to keep the house clean and tidy with their help. Today’s post was from Anita Edwards: professional writer and editor. She works as blog editor at Spekless, where she shares her own and her colleagues’ tips for cleaning. In her free time, she enjoys cooking and going on day trips with her children.